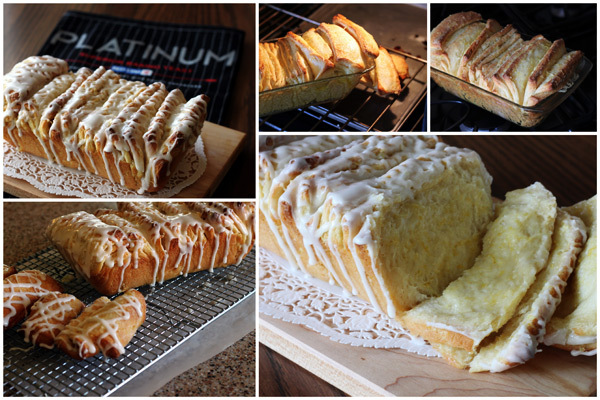 Layers of light, fluffy sweet bread sandwiched with sweet, fragrant lemon sugar, then drizzled with a tart lemon glaze. My sweet friend, Tiffany, Food Finery, and her adorable daughter came over and we had fun whipping up these beautiful lemon loaves. Tiffany teased me a little bit about measuring the dough with a ruler so my layers would be exactly the right size, but that’s one of the things I love about baking – the challenge of getting it just right, but I also think using a ruler makes it easier. Red Star says baking is magic and I couldn’t agree more. I love watching a loaf of bread magically rise and turn golden brown in the oven. Not only is it magic, but it’s also easy, and Red Star’s made it even easier with their new Platinum yeast. Now there’s no reason to be afraid of baking with yeast. Red Star sent me packages of their brand new yeast, Red Star Platinum Superior Baking Yeast to try. It’s a premium instant yeast with added dough enhancers used by professional bakers. It’s especially effective for baking whole grain and sweet breads that are bigger and light and airy. Sweet breads are one of my favorites, so I couldn’t wait to put the new yeast to the test. 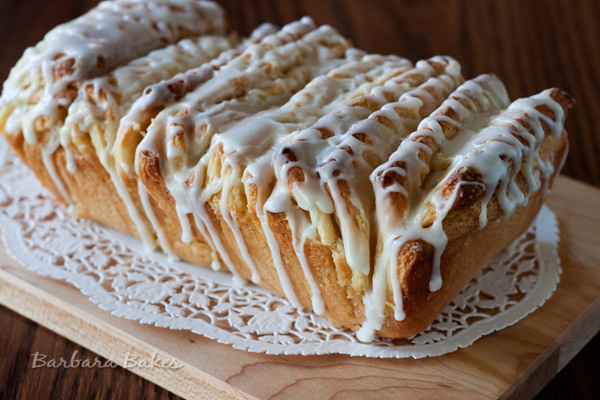 This Lemon Pull-Apart bread has been on my must try list since I saw it on Buttercream Barbie. I changed the recipe significantly to take advantage of my KitchenAid stand mixer and the Platinum instant yeast. We made two loaves and put the yeast to the test by letting one loaf rise until it was puffy and doubled in size before baking it. The second loaf only rested for 15 minutes after we shaped it, then we popped it in the oven. My family devoured this bread. It’s a gorgeous loaf, but really not complicated or scary to make. Tiffany and I were impressed with the Red Star Platinum yeast. It’s a very forgiving yeast and I’m looking forward to more fun baking adventures using it in my kitchen. 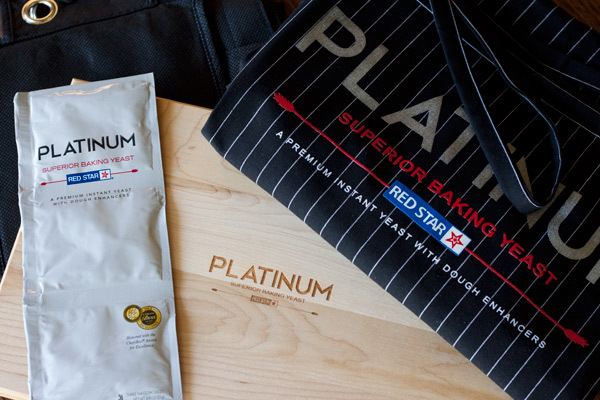 So you can try their new Red Star Platinum yeast too, Red Star is hosting a sample package giveaway. Details on the giveaway are at the bottom of this post. The winner from my blog will also be entered into a random drawing, with the winners from all the other participating blogs, for a ‘Platinum’ KitchenAid Mixer. Good luck! In saucepan or microwave safe dish, heat milk and butter until warm (120° - 130°F; butter does not have to be completely melted). Add liquids to flour mixture. Add vanilla. Blend at low speed until moistened. Beat in eggs one at a time. Beat 3 minutes at medium speed. Punch down the dough. On a floured surface, roll the dough into a 20" x 12" rectangle. Spread the butter evenly over the dough with a rubber spatula or pastry brush. Cut dough in to five strips, each about 12" by 4" with a pizza cutter. Sprinkle 1 1/2 tablespoons of the lemon sugar over the first buttered rectangle. Top it with a second rectangle, sprinkling that one with 1 1/2 tablespoons of lemon sugar as well. Continue to top with rectangles and sprinkle, so you have a stack of five 12" by 4" rectangles, all buttered and topped with lemon sugar. Cut the stack into 6 rectangles (each should be 4" by 2") Carefully transfer the rectangles of dough into the loaf pan, cut edges up, side by side. 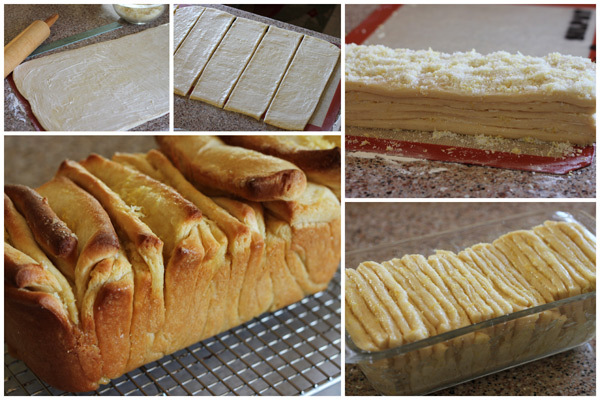 You might have some extra room around the edges but the bread will rise and expand during baking. Loosely cover the pan with plastic wrap and let the dough rise in a warm place until puffy, 30 to 50 minutes. When you gently press the dough with your finger, the indentation should stay. Bake 30 to 35 minutes until the loaf is golden brown. Cover the top with foil if it's browning too quickly. Transfer to a wire rack and let cool in the pan for 10 to 15 minutes. While bread is cooling, make the lemon icing. Whisk together powdered sugar and lemon juice until smooth. Use the parchment paper to help remove the loaf from the pan. Flip the loaf over onto a cooling rack, remove the parchment paper, then flip onto another rack so that it’s right side up. 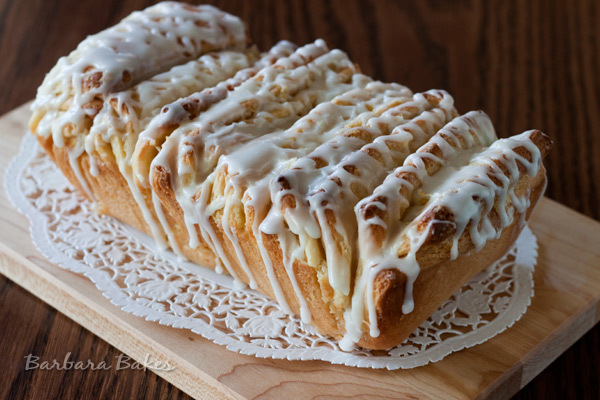 Drizzle icing over bread. Serve warm or at room temperature. -The winner from my blog will also be entered into a random drawing, with the winners from all the other participating blogs, for a ‘Platinum’ KitchenAid Mixer. The Grand Prize drawing for the KitchenAid mixer will be held on Monday, November 12, 2012. Leave a comment on this post before Monday, October 8th at noon, MST. Leave a separate comment for each entry. The giveaway is only open to residents of the US and Canada. Be sure your email address is included with your comment(s). Winner will be chosen randomly, notified by email and will have 48 hours to respond before another winner is chosen. This post is sponsored by Red Star, however, all opinions expressed are always my own.